The Burning Snowman Fest is an event designed to help think warm thoughts during these cold times. Revelers will gather once again on February 24, 2018 for this popular event. The host locations are Mr. Ed’s Bar and Grill and Dock’s Beach House in Port Clinton. Also, other local bars will be offering great specials for this event. More importantly, this event’s purpose is to raise funds for local charities. There will be live entertainment, food, hobo bonfires and even hot tubs to soak in. Entertainment will be selected from the wide selection of local talent. One band will even get to make their big debut. 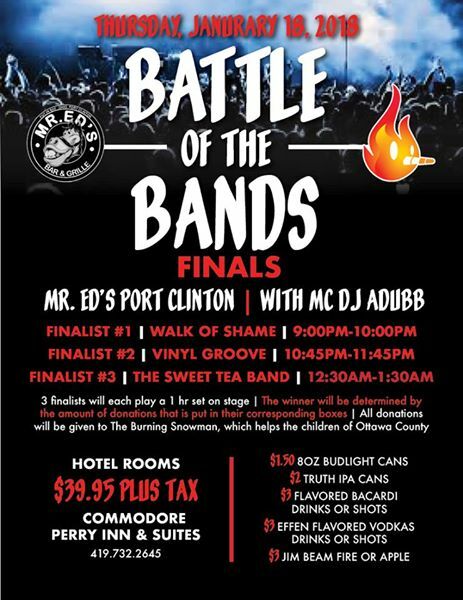 See below for information about this great prelude to the Burning Snowman 2018 on Thursday, January 18th. 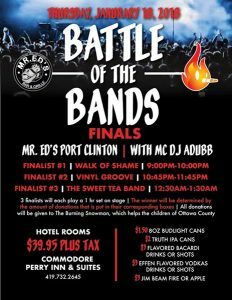 The winner will even get a chance to play at Mr. Ed’s Put-in-Bay this Summer! There is no better place to stay for this festival than the Commodore Perry Inn. The location is absolutely prime. Guests will be on site for the entire event. So, all of the fun to be had will be mere steps away. 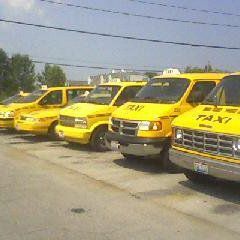 For transportation for any time during the festival, Call the friendly folks at After Hours Taxi. They will be out in full force ensuring guests the utmost safety. So, don’t drink and drive! Instead, call After Hours for a sober skipper! This event has gained traction as the must attend event of the Winter. Therefore, many of the local lodging options fill up fast. There is no better way to experience it all than to stay right at the party. So, you won’t miss out on all of the great fun. Lastly, lest not forget that this is a party with a purpose. 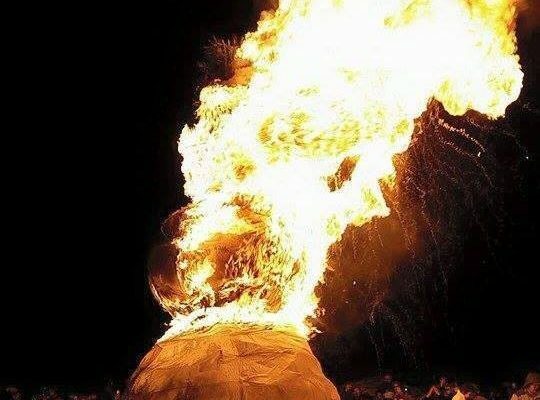 The generous donations of Burning Snowman attendees has made a great impact on the local community. Come out and do your part and wish Winter away! Burn baby burn! 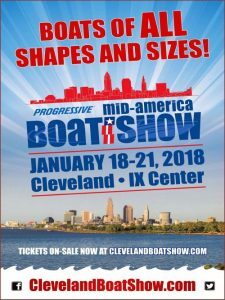 The Mid America Boat Show returns to the I-X Center in Cleveland, Ohio January 18th. 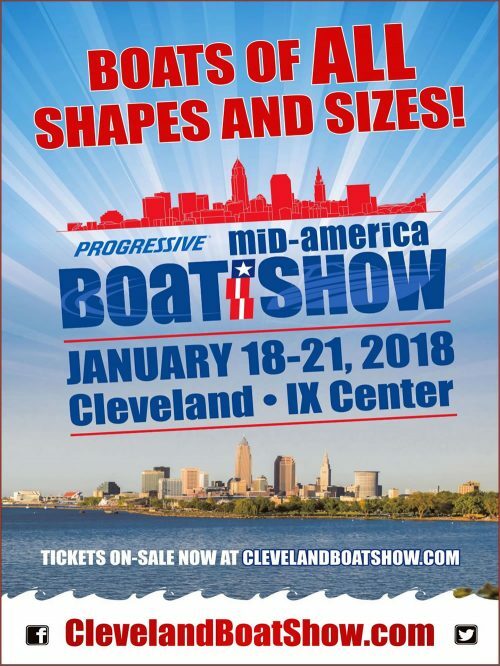 This is the largest and oldest boat show in Ohio. Here, there are many fun and entertaining things to do and see. Bring the family for a taste of Summer in the middle of the Winter! 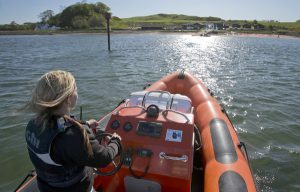 Also, browse from over 400 boats onsite. 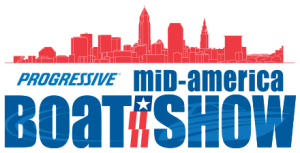 Boat dealers and boating vendors will be on hand offering the very best products and services. There’s no better way to forget about the cold Winter than thinking about Put-in-Bay. So, be sure to stop by the Put-in-Bay Pavilion at the Boat Show. Here, have a taste of the legendary Boardwalk Lobster Bisque. 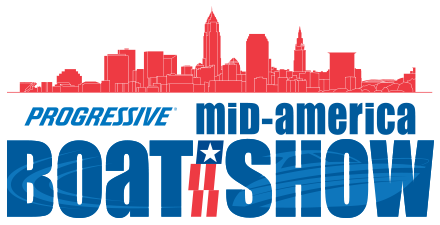 Also, enjoy from live entertainment from local favorites West Side Steve, Ray Fogg and Pat Shepard. This will take place at 7 PM. However, to secure a good spot for the show, it is recommended to stop by earlier. So, see you at the show for Put-in-Bay night! More info about the entertainment can be found here. This hands-on exhibit features a 5,000 gallon aquarium on wheels. 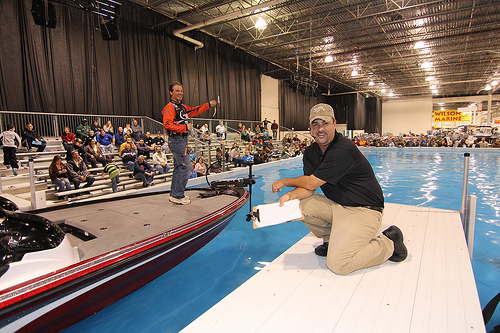 Here, fishing experts will give intriguing demonstrations. Also, they will show how fish react to bait and how they secure it. Children can learn how to rig and use a cane fishing pole. So, stop by for this unique experience. 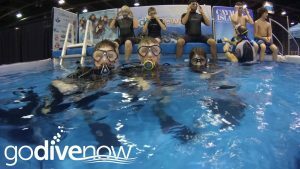 Participants can go scuba diving in a wet suit. Certified diving instructors oversee for instruction and safety. Furthermore, dives are completed in a 30 foot 15,000 gallon pool. So, come and see what it’s like to scuba! Come by with the whole family for a variety of fun activities. Also, be sure to catch Pirate Willie’s Pirate Show with the little ones. So, join in on the fun! Each day, experts will give presentations about all things Lake Erie. Furthermore, this will include weather Lake Erie Ports, invasive species, algae blooms, weather forecasting and more. So, stop in and learn about our greatest natural resource. So, mark the calendar for this great event. Shake off the blustery cold and think about a beautiful day boating on Lake Erie. Lastly, turn your dreams into reality and Book Your Put-in-Bay Vacation Now! 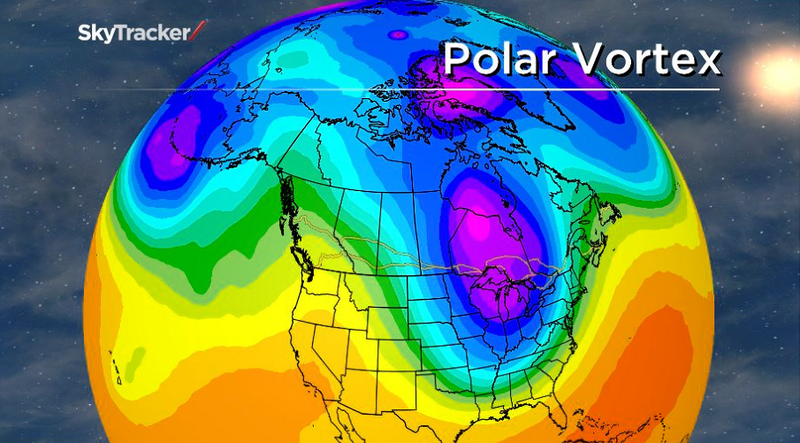 Currently, a Polar Vortex has swept across the region. According to an article on Live Science, a polar vortex is part of a low-pressure system. Moreover, as winds blow in towards the center of the system where the lower pressure is located a phenomenon occurs. This is known as the Coriolis Effect. In the Northern Hemisphere the storms spin counterclockwise and in the Southern they spin clockwise. The Earth’s spin causes this effect. During the Winter months, the North Pole tilts away from the Sun. Due to the perpetual darkness, the temperature gradients vary. Consequently, these gradients power wind, which in turn leads to a low pressure system swirling around the pole. This vortex resides within the stratosphere. However, when it dips into the troposhere, we see the frigid air affect our weather. This is the year to finally make way to Put-in-Bay for some hard water fishing. If the conditions hold up, this may be one of the most fruitful seasons in several years. Fortunately, there are transportation and lodging options available for anglers. First, getting to the island. Currently, the only mode of transport is via airplane. Below are links and contact information to book air travel to the island. So, you’ve made it to the island. The flight was a scenic wonder with ice as far as the eye can see. Now it begs the question, where to stay? Fortunately, there are lodging options that are open year round. 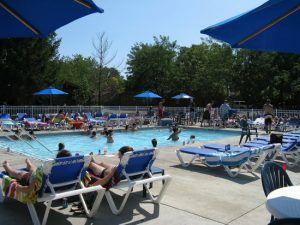 The Bay Lodging Resort is a quiet, newly renovated resort located just steps from downtown Put-in-Bay. Anglers can get some rest after a fun day on the ice. Also, the launch point for many fish guides is nearby at the Public Docks. So, the Bay Lodging Resort is an excellent choice for hard water fisherman. 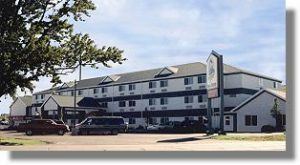 The Commodore Resort is located on Delaware Avenue in downtown Put-in-Bay. So, ice anglers can walk to the docks and restaurants easily. Rooms available for ice fisherman. So, you’ve made it to the island, checked in and are ready to fish. Unfortunately, your ice shanty and gear wouldn’t fit on the airplane. Don’t fret. There are ice fishing guides ready to assist. So, choosing an ice fishing guide is the best way to get on the fish. Also, they are equipped with the gear needed to make it happen. So, the stage is set. Now, we just need the players! 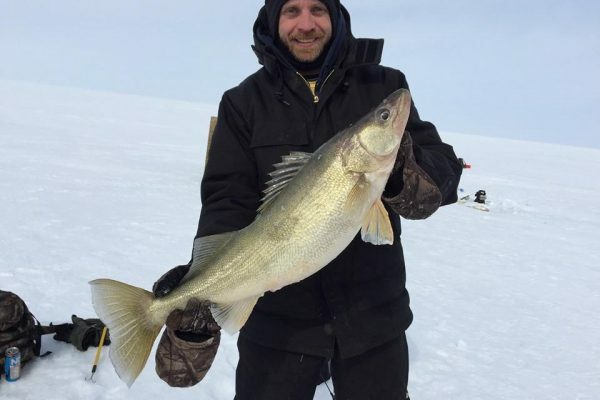 So, don’t wait to plan your ice fishing adventure. There is nothing better than cooking up fresh fish from the ice. Using these resources, a complete trip can be planned. 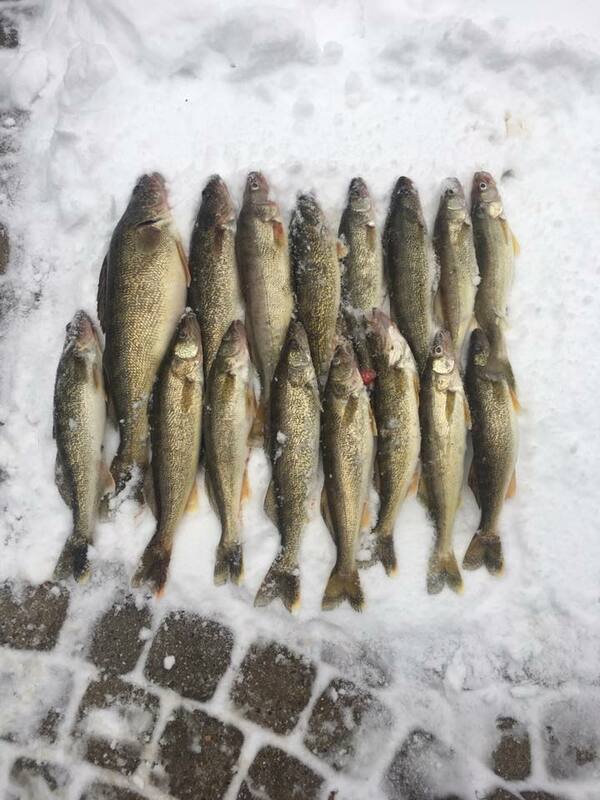 Hopefully this will be an ice fishing season for the ages. See you in a shanty! 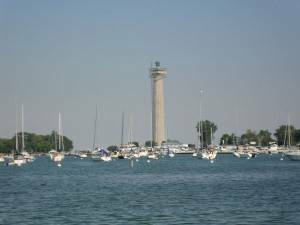 Why Put-in-Bay? For starters, the nightlife is nothing short of legendary. Furthermore, with over 40 bars and night clubs, the fun is never ending. Add 4 pool bars to this mix, and great times await no matter the time of day. So, bachelor and bachelor parties can look forward to a great experience. Furthermore, there are numerous great restaurants to have a nice dinner. Options range from a scenic meal at the Upper Deck at the Boardwalk to a more casual lunch at Mr. Ed’s Bar and Grille. Also, for late night eats, the Put-in-Bay Pizza Company is ready to deliver the goods. Pizzas teeming with toppings and hearty grinders are highlights. 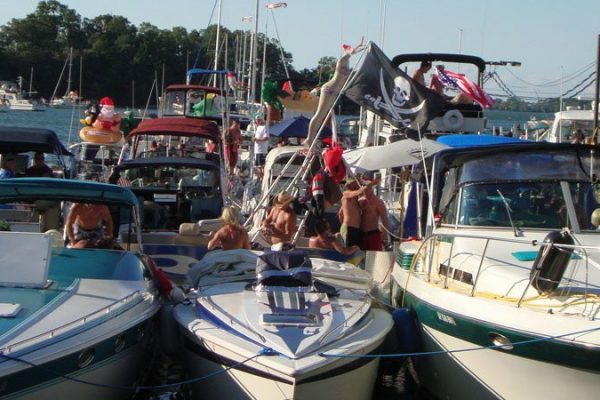 A Put-in-Bay Bachelor party is truly unforgettable. The Island Club is a development of vacation rental homes. Here, guests can enjoy the comforts of home such as separate rooms, full kitchen and private space. Multiple homes can be rented to accommodate the largest groups. Also, there is a pool on site where guests can bring their own beverages. Many bachelors and bachelorettes have had their celebrations here. This resort has a variety of fabulous lodging choices. Moreover, guests can choose from different hotel rooms with varying capacity and features. Also, the Put-in-Bay Villas are located here. These large town homes are ideal for bigger groups. The Villas are fully furnished with separate bedrooms, kitchen and comfortable living space. Also, the Blue Marlin pool bar is on site. Here, guests can have fun in the sun at one of the the most popular spots on Put-in-Bay. 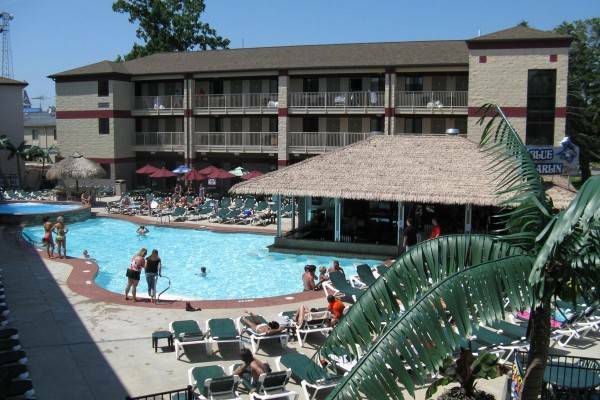 The Commodore Resort is located in downtown Put-in-Bay, just steps from all of the action. This hotel has a variety of room offerings in two separate buildings. Also, the Mist Pool Bar is on site. Here, revelers can dance the day away listening to local DJ’s spin tunes. Additionally, Mr. Ed’s Bar and Grille is located at the front of the property. Great food, cold drinks and superb entertainment awaits at Mr. Ed’s. 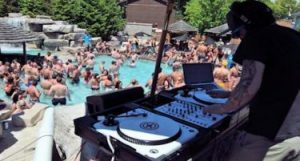 Put-in-Bay continues to be a wildly popular destination for bachelor and bachelorette parties. The groups come from all across the Midwest. So, whether it is a Chicago Wedding, Buffalo Wedding, Pittsburgh Wedding or if it is right at home for an Ohio Wedding, Put-in-Bay is the answer. Unbeatable nightlife, comfortable lodging and a central location make the island well suited. 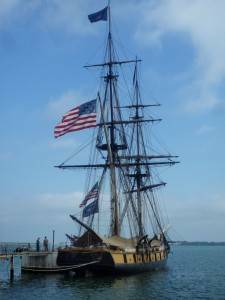 Research more about things to do on Put-in-Bay and Reserve Yours Today! The Miller Ferry Crew, led by Billy Market, provides islanders and visitors safe passage to the island. This crew works tirelessly to ensure that the vessels are safe and in working order. Also, they undergo training in preparation to respond in an emergency situation. So, when making way to Put-in-Bay, riders are in good hands. Safety never takes a day off at the Miller Boat Line. There are 4 Vessels that comprise the fleet. 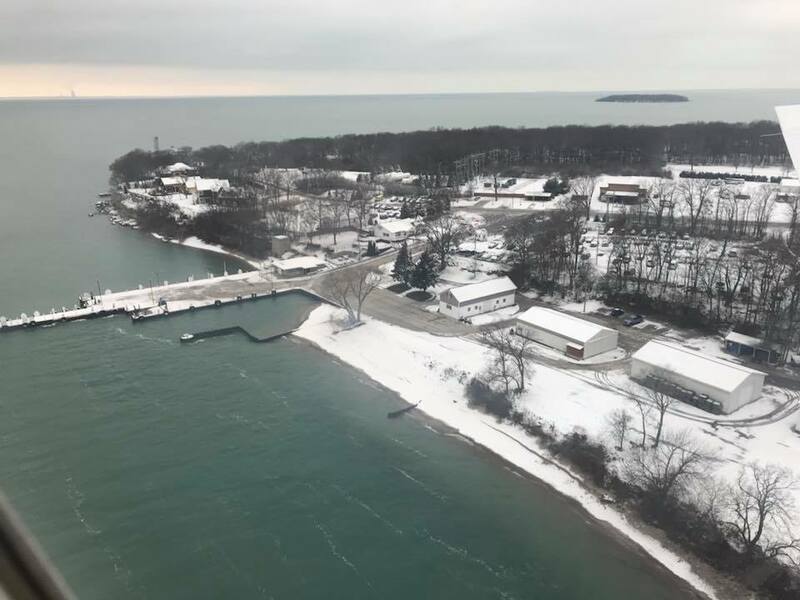 A fifth Put-in-Bay Ferry has been ordered and is expected in service in 2019. This Put-in-Bay Ferry Service is the lifeblood of the island for most of the year. Now, islanders must rely solely on airplanes to traverse to the mainland. Additionally, common perishables like eggs and milk will make way to Put in Bay across Lake Erie through the air. Still, life will continue on South Bass Island. Islanders will make their way by plane for doctor appointments, meetings and more. For them, it is a common way of life. Now, the Miller Ferry Crew will be busy preparing the boats for the hibernation. Maintenance, cleaning and upkeep tasks await, so the boats are ready for the next season. Then, the crew will get a much deserved break. Each season, the varying Put-in-Bay Weather dictates the last day of the season. Many islanders make guesses as to when the boats will cease. Interestingly, there is even a chance to guess the date and win at the local pub! Thank You Miller Crew: Our Put-in-Bay Ferry! 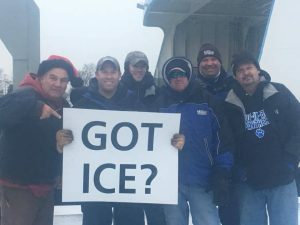 Fortunately, the weather cooperated so that the Miller Ferry Crew can spend the Holiday season with their loved ones. Their dedication and effort is greatly appreciated. The island of Put-in-Bay is fortunate to have such safe and reliable transportation. Cheers to the crew for another great season. Think ICE! Time to Reserve for 2018! With the Miller Ferry Service coming to an end for the season, it is time to start planning for Summer 2017. Many dates sellout quickly. So, BOOK NOW to reserve your Put-in-Bay Lodging. St. Paul’s Episcopal Church will offer a burial service for three unknown residents of the island who resided at South Bass Island over 100 years ago. They are believed to be an infant, a teen and an adult. The service at Maple Leaf Cemetery on October 22nd will use prayers which would have been used in the period when they lived. The funeral procession will begin at St. Paul’s Church at 1:00pm and proceed through the village giving these unknown residents the same respect current residents receive. Their shared shallow grave was found during construction several weeks ago. 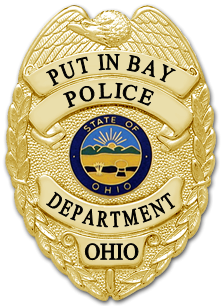 The Put-in-Bay Police Department turned over the bones to the Ottawa County Coroner who examined them and consulted a and determined they are at least 100 years old. It seems likely they died many years earlier than that. Lieutenant David Cimperman of the Put-In-Bay Police department is serving as the next-of-kin for the three individuals and coordinating the arrangements with Maple Leaf Cemetery, Burr Funeral Home and Rev. Mary L Staley of St. Paul’s Episcopal Church who also serves as the PIB Police Chaplain. All of the expenses for the burial of the unknown residents have been donated by Burr Funeral Home and local residents. All residents at Put-in-Bay are welcome to attend this memorial service for the unknown residents from the past. Although residents may speculate about the cause of death and may propose various ideas, the coroner’s office believes there is not enough information available to determine their cause of death although, foul play is not considered a cause. 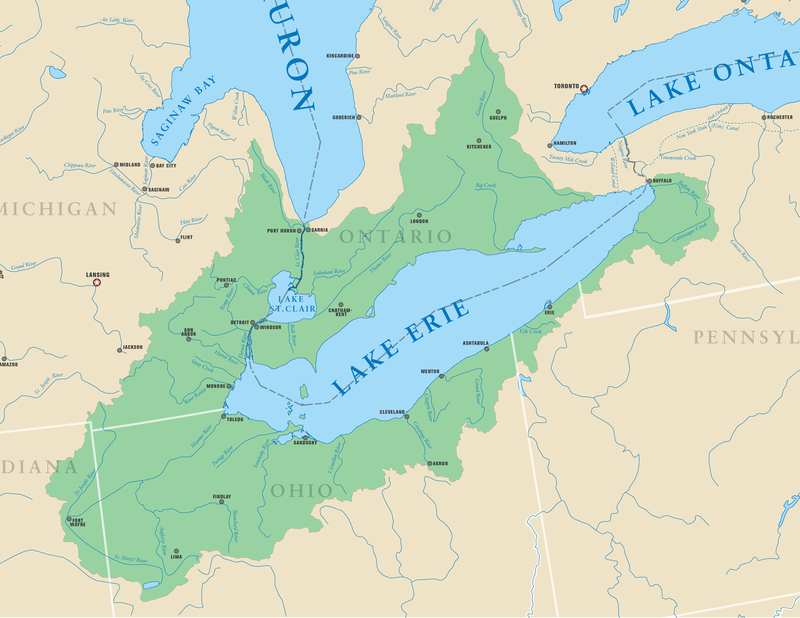 In the time period between the Battle of Lake Erie and the late turn of the century many residents died from the effects of cold weather, various diseases and drowning. Most island guests begin their journey to Put-in-Bay aboard the Miller Ferry. Miller Ferry provides the only service for both passengers and vehicles to Put-in-Bay (South Bass Island) and Middle Bass Island. They also offer the lowest fares and free parking if you are not taking your vehicle to the island (the Jet Express has free parking too). Visitors enjoy the half hour scenic ride to Put-In-Bay up top in the indoor or outdoor seating areas with beautiful views. 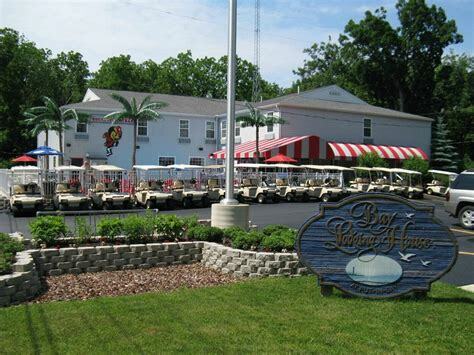 Once you get to Put-In-Bay, golf carts are a must in order to get around the island and see everything that there is to see. Delaware Carts downtown offers great golf cart rentals, discount coupons and is located a short walk from the Jet Express (or a quick and fun Island Club Taxi ride from the Miller). Whether your family is 4, 6, or 8 people in size, there is a cart for you! The most common first stop for families is the Perry’s Cave Family Fun Center. This place has many different attractions and you can almost spend the entire day here. They offer cave tours, mini-golf, rock walls, gem stone mining, butterflies and more. The Perry’s Cave tour takes you below ground to explore a limestone cave that is over 200 feet long and lies 52 feet below the island. There are 20 minute guided tours that take place about every half hour during the busy season. Kids and adults alike can learn all about the cave, how it formed, and it’s rich island history with the professional and polite tour guides. This is a must-see when visiting Perry’s Cave Family Fun Center! This fully enclosed garden is home to 50 different types of butterflies from all over the world. Walk among them and take in their beauty as hundreds fly around you. Don’t be surprised if a few even land on you. For those who enjoy mini-golf, the War of 18 Holes putt putt golf is an entertaining 18-hole mini golf course that is perfect for kids and adults of all ages. The course wanders amongst waterfalls, miniature island monuments, streams, and many beautiful plants and flowers. At the start of each hole, you can learn some facts and history about the War of 1812. Another fun attraction at Perry’s Cave Family Fun Center is Fort Amaze’N, a challenging maze that the kids will love. As you walk through the maze, there are 4 letters you need to find and punch in on your “passport.” Once you find all of the letters, you then need to find your way out. If you complete the maze, you win a prize. 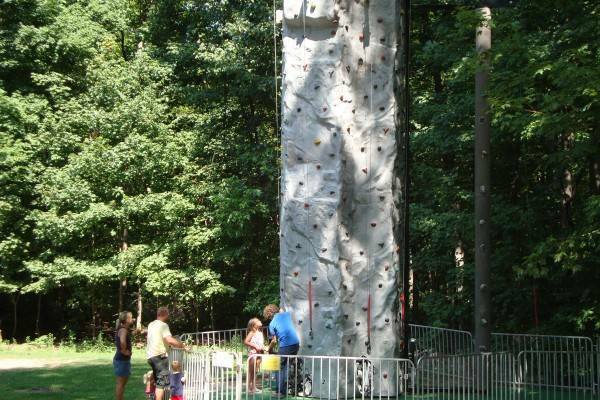 Finish the course in 5 minutes or less and you win a climb on the rock wall. There are four sides to the wall, all ranging in difficulty from easy to hard levels. The four sides also allow for visitors to race against one another. When you are ready to slow things down a bit, try out the gem stone mining at Perry’s Cave Family Fun Center. You can pan for real gems, minerals and fossils at the mining sluice. A chart is on site so you can identify all the different gems that you discover, and the best part is that the gems you find are yours to keep. If you want to spend some time on the waters of Lake Erie itself, Put-in-Bay Watercraft Rentals has everything you need. You can rent stand-up paddle boards, kayaks, wave runners, and even power boats. They also offer sightseeing tours of Rattlesnake Island and they are conveniently located at the State Park boat ramp. Reservations can be made online. Whatever your family decides to do at Put-in-Bay, you are guaranteed to have fun! And if you want to spend the night, we have many houses and Waterfront Condos to enjoy your stay. Lonz Winery on Middle Bass Island reopens to the public! It seems like just yesterday, but it’s actually been sixteen years since the deadly porch collapse which closed the Lonz Winery on Middle Bass Island. Now, the historic beauty is ready for her next chapter: as the centerpiece of a state park with terrific waterfront views. 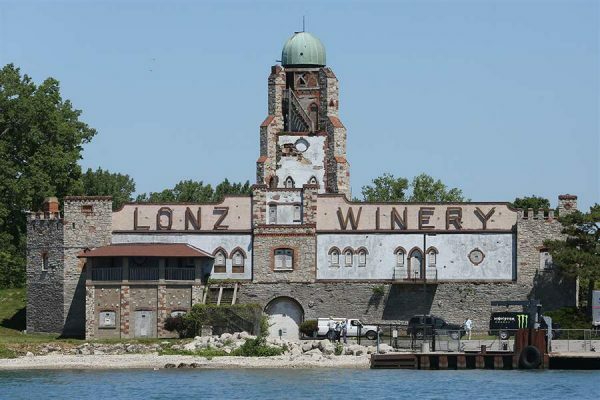 The historic Lonz Winery has been rehabbed and renovated on Lake Erie’s Middle Bass Island. It will become the centerpiece of Middle Bass Island State Park. The Ohio Department of Natural Resources on Friday hosted a grand opening celebration at the park, accessible by ferry from Catawba Island. The event ran all afternoon, and there was a great turnout from the general public who was invited. The state completed work this spring on the historic winery, which dates back to the late 19th century. The iconic Lonz tower, built in the 1930s and easily seen from approaching boats, has been restored, as has the main building facade. The building, however, has been converted into an open-air plaza. Five wine cellars have been restored, as well as has the winery’s former press house. The state is in talks with possible vendors interested in serving food and/or wine in the press house. Although that may not happen until next year. Access to Middle Bass Island is via the Miller Ferry, which offers regular service from Catawba Island on the Ohio mainland, just east of Port Clinton. The Middle Bass Ferry provides transportation between Middle Bass and nearby Put-in-Bay. The state purchased the former winery in 2001, a year after a porch collapsed on the property, killing one man and injuring 75. For years, the property sat vacant and deteriorating, the state unable to afford its restoration. In 2014, the Ohio Legislature set aside $88 million for park improvements – and the former Lonz property was on the top of the state’s do-to list. Cost of the Lonz renovation is $5.7 million, according to Santiana. A cement terrace loaded with tourists collapsed at an island winery in Lake Erie Saturday afternoon, killing two people and injuring dozens, authorities said. The collapse left a gaping hole in the floor of the lakefront terrace at Lonz Winery’s century-old main building, a fortresslike mansion on the National Register of Historic Places. The floor’s rubble fell 20 to 30 feet into an unoccupied wine cellar, authorities said. The floor apparently collapsed under the weight of the 80 to 100 people on it. Two of the victims were confirmed deadand an estimated 30 people were critically injured. Canada Day is the national day of Canada. A federal statutory holiday, it celebrates the anniversary of the July 1, 1867, enactment of the Constitution Act, 1867 (then called the British North America Act, 1867), which united the three separate colonies of Canada, Nova Scotia, and New Brunswick into a single Dominion within the British Empire called Canada. Originally called Dominion Day, the holiday was renamed in 1982, the year the Canada Act was passed. Canada Day celebrations take place throughout the country, as well as in various locations around the world, attended by Canadians living abroad. 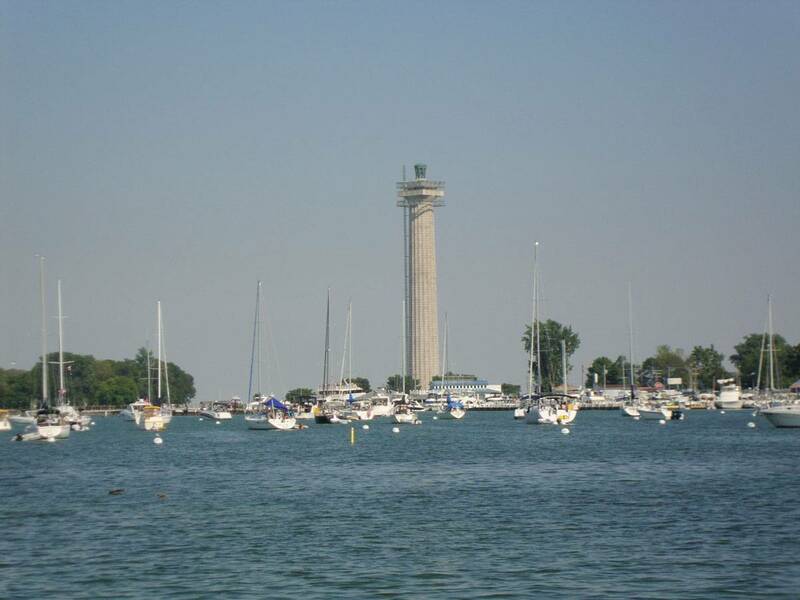 Put-in-Bay celebrates the weekend with many Canadian visitors coming to the island and enjoying some time away. 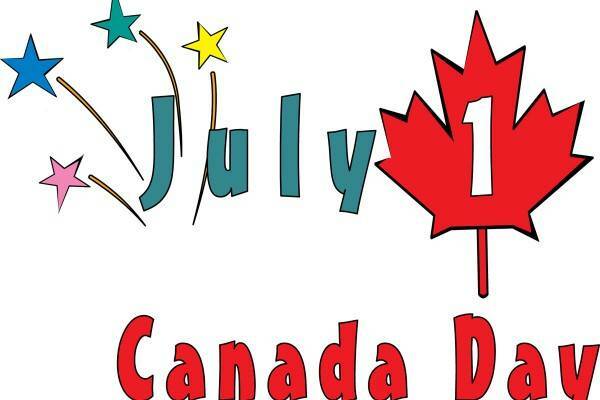 Under the federal Holidays Act, Canada Day is observed on July 1, unless that date falls on a Sunday, in which case July 2 is the statutory holiday. Celebratory events will generally still take place on July 1, even though it is not the legal holiday. If it falls on a Saturday, any businesses normally closed that day will usually dedicate the following Monday (July 3) as a day off. Most communities across the country will host organized celebrations for Canada Day, typically outdoor public events, such as parades, carnivals, festivals, barbecues, air and maritime shows, fireworks, and free musical concerts, as well as citizenship ceremonies. There is no standard mode of celebration for Canada Day; Jennifer Welsh, a professor of International Relations at the University of Oxford, said about this: “Canada Day, like the country, is endlessly decentralized. There doesn’t seem to be a central recipe for how to celebrate it—chalk it up to the nature of the federation.” However, the locus of the celebrations is the national capital, Ottawa, Ontario, where large concerts and cultural displays are held on Parliament Hill, with the governor general and prime minister typically officiating, though the monarch or another member of the Royal Family may also attend or take the governor general’s place. Smaller events are mounted in other parks around the city and in Gatineau, Quebec. Canada Day also coincides with Quebec’s Moving Day, when many fixed-lease apartment rental terms expire. The bill changing the province’s moving day from May 1 to July 1 was introduced by a federalist member of the Quebec National Assembly, Jérôme Choquette, in 1973, in order not to affect children still in school in the month of May. PUT-IN-BAY: Eugene H. “Tipper” Niese, 79, of Put-in-Bay, OH died Wednesday, April 12, 2017 at Stein Hospice Care Center, Sandusky, OH. He was born May 13, 1937 in Ottawa, OH the son of Walter and Marcella (Weis) Niese. He married Carol Hoersten on March 4, 1957 and she preceded him in death on August 6, 1984. He graduated from Ottawa Glandorf High School where he was vice-president of his class. He was previously the Ottawa Fire Chief and he coached basketball and had several businesses in Ottawa. Tip moved to Put-in-Bay in 1975 and took over the Island General Store. In 1979 he bought The Colonial which housed The Beer Barrel and Tippers. The Colonial was leveled by a fire in 1988. Tipper rebuilt the Beer Barrel and Tippers and was currently the President of The Colonial, Inc. He was a member of Mother of Sorrows Catholic Church. 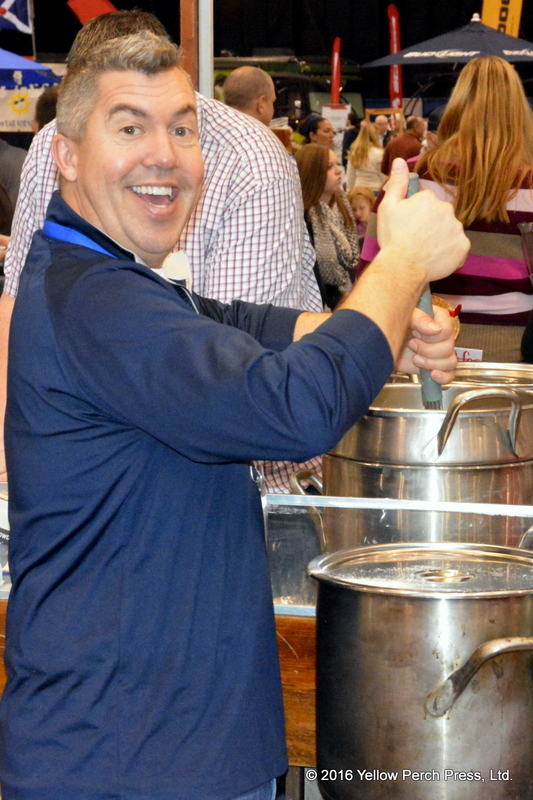 Tipper loved Put-in-Bay and was always giving back to the community. He was a generous contributor to many charities and events. He enjoyed talking with Islanders and Tourists. Surviving are his sons: Timothy Niese, Michael (Beth) Niese, Jeffery (Kelly) Niese; daughters: Tamara (Larry) Knaser, Pamela (Greg) Hughes all of Put-in-Bay; grandchildren: Amy, Josh, Melissa, Celeste, Daniel, Timmy, Chad, Alex, Lucy; several great-grandchildren; sister: Joyce Burkhart of Sylvania, OH. He was preceded in death by his parents, wife: Carol; children: Tippie and Kathy Niese; grandson: Bradley Hughes and daughter-in-law: Bonnie Niese. A Mass of Christian Burial will be celebrated by Father Nick Cunningham and Father Nathan Bockrath at 12:00 noon Tuesday, April 18, 2017 at Mother of Sorrows Catholic Church, Put-in-Bay, OH. Visitation will be held Monday in the Cornerstone Room of Mother of Sorrows Catholic Church from 1:00 – 4:00 pm and Tuesday from 9:30 – 11:30 am. Burial will be in Mapleleaf Cemetery, Put-in-Bay. 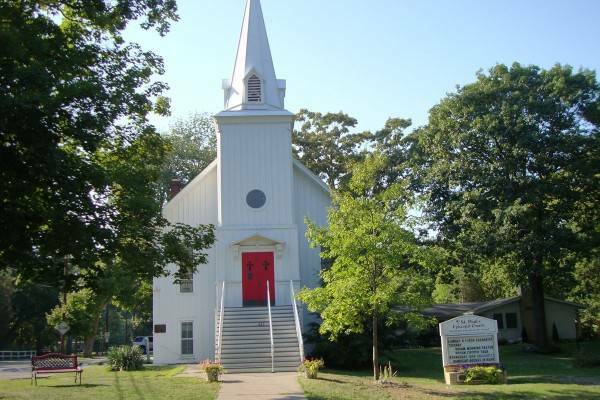 Memorial contributions may be given to Mother of Sorrows Catholic Church, 632 Catawba Ave. Put-in-Bay, OH 43456, Put-in-Bay Fire & Rescue; Put-in-Bay Emergency Medical Services or Stein Hospice, 1200 Sycamore Line, Sandusky, OH 44870.